Money matters, investment decisions, building wealth for your future – these are fundamental aspects of life. And while money might not be able to buy happiness, financial security has a significant impact on our overall wellbeing and a direct impact on the quality of our life in retirement. 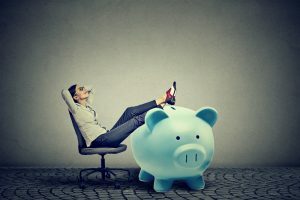 So, though these should be issues that take a priority position in our lives, why do the majority of us remain so disengaged with long-term financial decisions and investments? 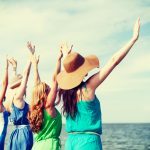 And why is this even more so for women – especially considering that women are already at a disadvantage in terms of long term financial wellbeing compared to men? 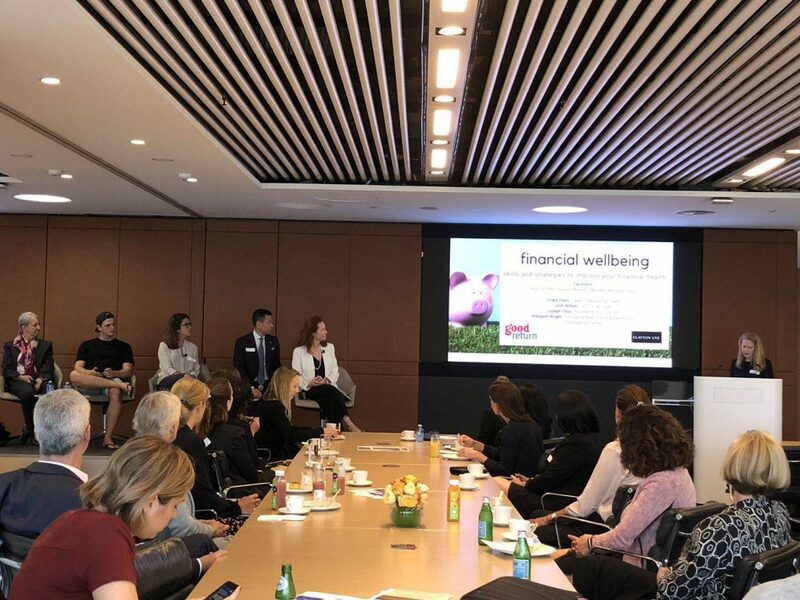 In celebration of International Women’s Day, Clayton Utz Deputy Chief Executive Partner, Kate Jordan, hosted a panel discussion on financial wellbeing, in support of non-profit organisation Good Return. 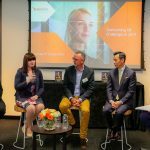 The panel featured KPMG’s first female partner, Margaret Wright; CEO of Grow Super, Josh Wilson; academic and head of marketing at US stock market trading platform Stake, Grace Palos; along with our CEO, Joseph Chou. The discussion was facilitated by Westpac’s Head of Women’s Markets, Felicity Duffy. The panel provided practical insights into improving your financial health and building wealth for the future, sharing research, strategies as well as personal experiences and stories. Margaret Wright talked about her career after deciding to leave KPMG, stating that despite her considerable corporate success, she hadn’t yet achieved “financial sustainability” for her future. She therefore sought a role which would also provide stock options – eventually working for Macquarie Bank. However, despite a dramatic increase in the Bank’s share price over time, Margaret said her lack of time and understanding of the ‘collar’ strategy – something her adviser recommended she put in place – meant that even this path had not provided the financial outcome she had hoped for. Grace Palos, who has conducted significant research in the area of women’s financial decision making, mentioned that women tend to feel confused/overwhelmed when it comes to investment decisions even though they may be a ‘boss’ in every other aspect of their lives. And yet, once they overcome this hurdle and become investors, women tend to outperform men in their investments. “The myth that it is overly complicated, can be busted,” Ms Palos said. Josh Wilson of Grow Super, a start-up super fund aimed at millennials, said a core element of his business was helping younger people become more engaged with their super, for example through their app or having the choice to invest some of their funds in ethical businesses etc. “We want to help more people to see it as their money,” he said. 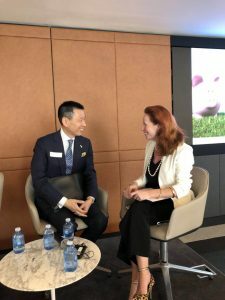 Ironfish CEO Joseph Chou with Westpac Head of Women’s Markets, Felicity Duffy. Joseph Chou spoke passionately about the relative accessibility of residential property investment; being a pathway to long term financial security that most ‘average’ Australian families can take, with a bit of help. 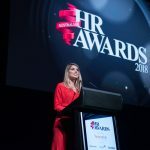 What the panel were all able to demonstrate clearly was that financial wellbeing is relevant to everyone – women, men, from senior professionals to 20-year-olds who are just starting out in the workforce. “With modern technological and medical advances, we will live longer than ever before – but how many people are actually prepared for the reality of that? How will people be able to afford to live that long?” added Mr Chou. Good Return is a non-profit organisation that works across the Asia Pacific to deliver economic and social development programs for the financially and socially excluded. 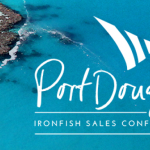 Ironfish launched our Financial Wellbeing program in 2017 in response to the growing need for organisations to address employees’ financial health as part of a wholistic wellbeing program. 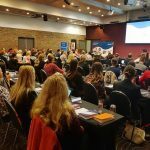 If you would like to find out how financial wellbeing can help drive engagement and performance in your organisation, please contact our program co-ordinator. We thank Good Return and Clayton Utz for the opportunity to be involved in this important event.